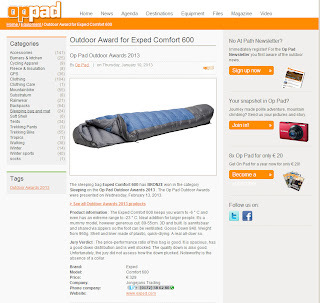 The Exped Comfort 600 wins a bronze award from Oppad Magazine in Holland. There are multiple versions of this bag in our line. In the USA the Comfort 400 (summer), Comfort 600 (spring/summer/fall), and Comfort 800 (winter) are available. The design concept for these is just what the name implies - comfort. These are still mummy bags, but they are cut more generously than others we make. Also, these bags have a zipper around the foot section that allows them to be opened into a blanket when conditions are warm. These are extremely high quality bags employing super soft nylon shells and polyester linings. We use 840 fill Polish goose down for insulation and all the details are there. For larger individuals these bags are a great fit and for smaller folks they represent a less restrictive sleep experience while still remaining efficient.